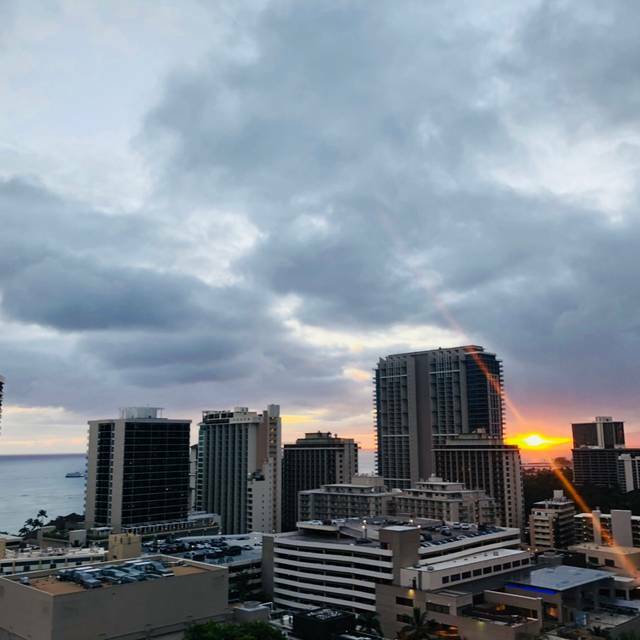 SKY Waikiki offers free validated parking in the Waikiki Business Plaza and the Waikiki Shopping Plaza, which is located directly across the street. 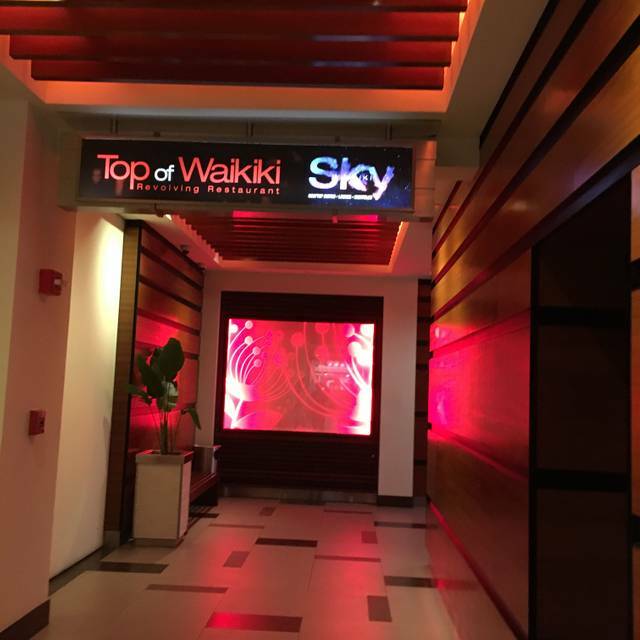 SKY Waikiki features live entertainment on the deck certain days, as well as a local DJ spinning two nights a week. 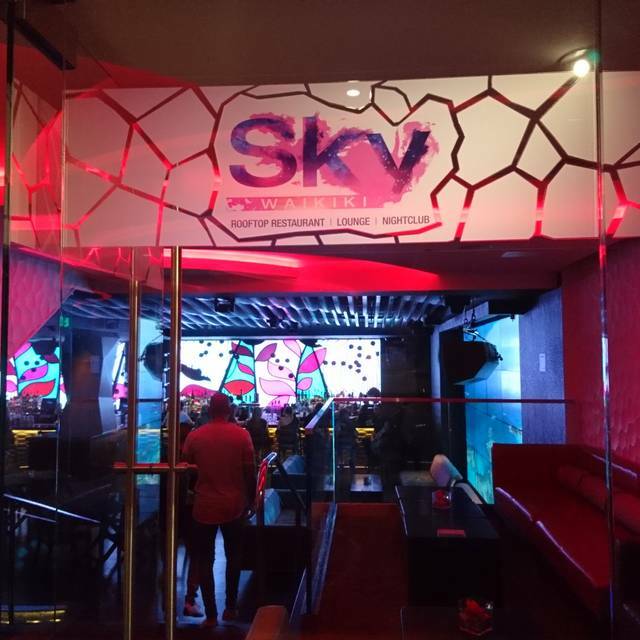 For information on special events email us: vip@skywaikiki.com or call us at: (808) 979-7591. 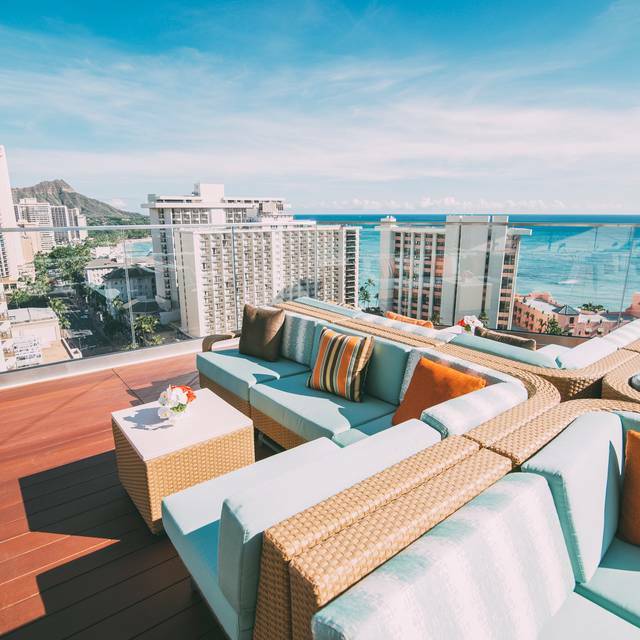 SKY Waikiki is a Rooftop Bar, Restaurant & Nightclub located 19 stories above the heart of Waikiki. 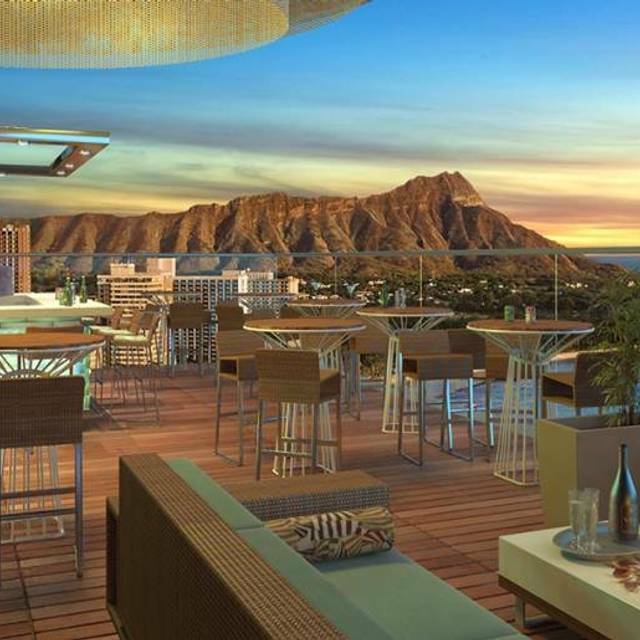 It features breathtaking sunset views, glittering city lights and panoramic vistas of the Pacific Ocean. 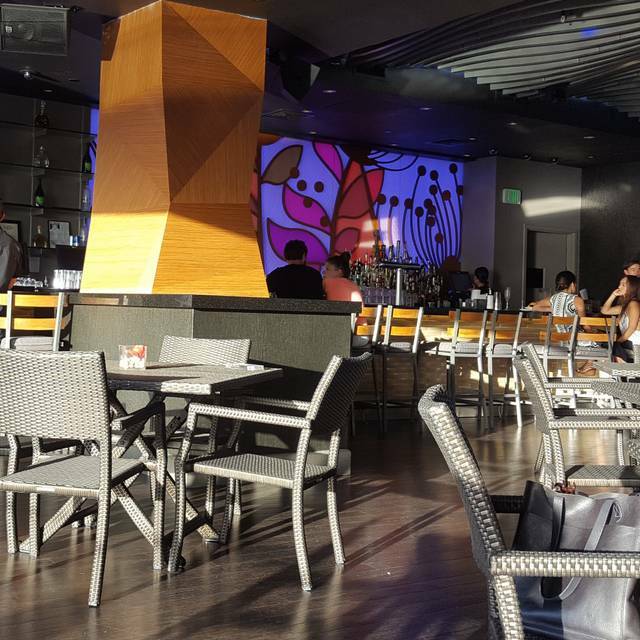 Enjoy dinner Sun, Tue, Wed, Thu, Fri from 5pm-11pm and Sat from 5pm-9pm. Happy hour is Tue - Sun frpm 5pm-7pm at the bar only. 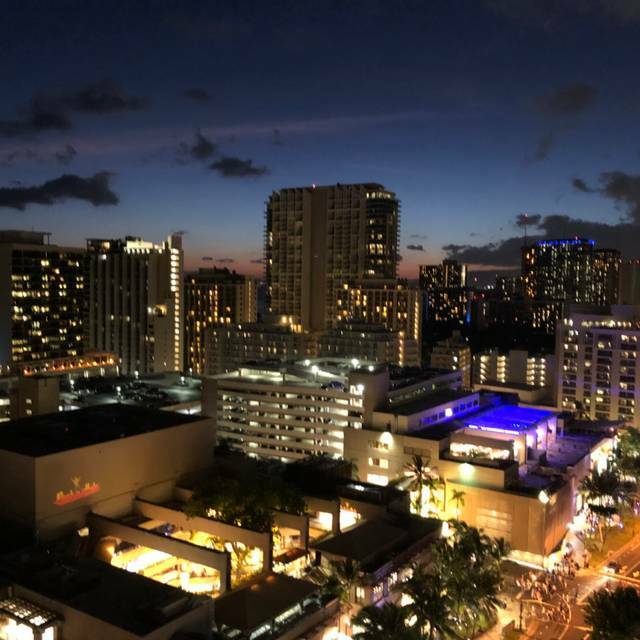 Celebrate Cinco de Mayo with food & drink specials accompanied by rooftop views of the Waikiki sunset and Honolulu city lights. Enjoy Braised Lamb Taquitos along with Don Julio cocktails for only $10 or bottles for $199. Plus, try our special Guava Margarita. Give Mom all the Hugs & Quiches she deserves. 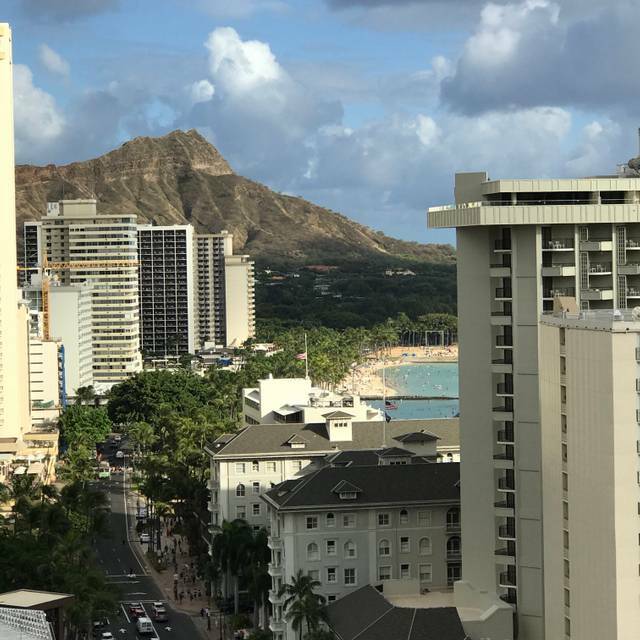 Enjoy the Soup, Salad, & Quiche special on Mother's Day, complete with rooftop views of the Waikiki sunset and Honolulu city lights. Plus, enjoy $14 Moet Imperial Champagne specials by the glass. The view and food are amazing. The service was excellent. Wine and champagne served in filthy (cheap) glasses. The food was amazing and the ambiance was unparalleled. I would highly recommend this location for a light meal with a date. First time there, but look forward to the next time. Great ambiance, but all must understand that outdoor dining comes with the occasional gusty wind that blows menus off the table and passing showers that bring out the restaurant-supplied umbrellas. 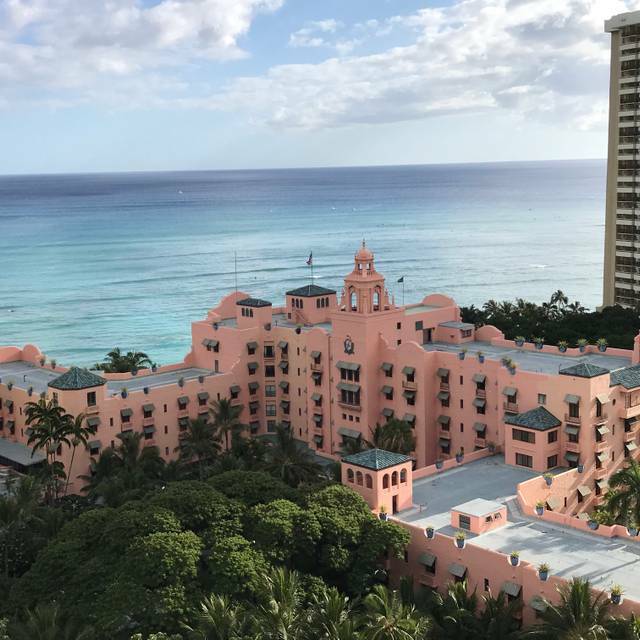 Food was good, but Waikiki pricy. Live music added to the fun ambiance. We made a reservation for 5:30pm and requested a table at the glass outer edge. While they say requests can not be guaranteed, we did get a table at the edge overlooking the ocean. The view from up there is quite impressive and we took many pictures to remember the occasion. We ordered 3-4 drinks and a spicy shrimp appetizer and we were very pleased with the food and service. This is a must-see for visitors to the island. I don’t know why it got soo many bad reviews because I had a blast. No wait time even after arriving late. The food is expensive but it was good . The view is to die for and there was live music. I can’t believe I almost did not go based off of other people’s review. Try it guys. Plus my server was the best! Very patient. I love that the person who seats u brings your server to you and introduces them to you. They do this for everyone who is seated at a table. Loved it!!! Loved the view - it was breathtaking. We made a reservation for five o'clock and the 90-minute dinner cap was perfect. It was about as long as we could stay given the heat. The food was delicious and priced fairly. I loved spending my birthday here! I wish we made it time for the food though!! The highlight of hubby’s birthday celebration. We enjoyed the live music performance by John Akapo very much. Loved the ambiance. The view was beautiful. The drinks and food were over priced. We made dinner reservations, but opted to go elsewhere because the prices were ridiculous for what you were getting. We had some (overpriced) drinks - they were okay. Nothing spectacular. I would go there for the view. Especially at sunset. Order one drink and head to the next place. Great views, food & service. Considering that each table is limited to 90 minutes following the reservation time, it would be nice if the doors were opened promptly by 5:00 pm. We had a group of eight - when we arrived we were told that there is a two hour window once your group is seated. This was fine with us. We waited about five minutes for and then asked to go ahead and be seated as the other part of our group was on their way up. They seated us at a nice large table with great views. It took a while for a server to get to our table. When he did he said he would take our drink order and then they would be moving us to another table which would be better for us. We're flexible...so okay. After a bit they moved us - our initial drink order still hadn't come. They moved us to a small cramped table where it would have been impossible for a group of our size to have any real amount of food comfortably. The table couldn't have been more than 4' square. Then then told us it was last call for the kitchen and if we wanted food we would need to order it immediately (our reservation was for 7:30 on a Saturday). Honestly...I just don't think they are all that serious about the restaurant portion of their name. Rather than be rushed we opted to just leave as it didn't seem they really wanted our business. This is a lovely location and if you are looking for a bar with great views and a little bit of food then this may be a good fit for you. As we didn't get the opportunity to try any of their drinks or their food I really can't comment on either. Their service was truly awful. Adam (server) and El (management team (not user of the spelling)) were fabulous, as were the greeters! If you're going to be a customer, ask for Adam to take care of you. If you own SKY, give everyone a big fat raise! The venue needs no comment, as the view and facility are over the top indescribable. It was a wonderful experience. The sunset was beautiful. Our service team, Jordan & Nairobi, was excellent. The food was amazing. Totally enjoyed the evening. The restaurant was nice and we will definitely be back. We were seated right next to the live music and it was really hard to hear each other and our waitress. She brought us an extra drink (we ordered three but we’re served four) because she couldn’t hear us very well. Overall, we will definitely be back, but will request a table far from the music. We brought our family here for a birthday dinner. It really felt more like a bar than a restaurant. Lovely setting, and our server was kind. It was odd to be greeted by the hostess immediately informing us that we had 90 minutes at our table, no more. There isn’t a big selection of food on the menu, so our kids had $19 burgers, plus extra for the toppings they wanted. The chicken sliders were good, but it was just that, nothing on the side. Drinks were just ok. The rooftop is nice at sunset and much better when the live music starts. Other than that, it feels like a pick-up bar for 20 somethings. Probably one and done for us. We love the outside view. Unfortunately, our server didn’t actually come to our table. When he finally came to take our order he was short and curt like we were inconveniencing him. We had to ask other workers for drink refills and other needed items. We waited to order dessert for 45 minutes and no server. Our table was cleared and we finally just went to ask for our check. Secondly, the food did not have good quality and taste. It was like the food is supposed to be interesting and different but they got it all wrong. We’ve eaten here before but we’re totally disappointed this time. Took 30 minutes to get my appetizer. When asked how much longer it would be, the waiter replied “I don’t know, I’m not cooking it.” Then when it finally came out, the order was wrong. I informed him it was wrong but I needed my check, because now I was running late. The waiter still charged me for the late and incorrect food. Food was good, atmosphere was great, service was terrible. Great atmosphere and fun evening. Food was really good but a bit pricey. The seating was tight, we made a reservation for five people but we were seated on two couches which should have been for four people. They would not let us pull up a chair because of fire code rules. Other then that it was a great evening. It was our first time to dine in for my daughter's birthday. Its fine as an experienced , delicious food but quite expensive and small portion. Servers were great and nice.... but what we paid is not worth it better going to a smorgasbord restaurant...coming back again. It was very neat, but when the sunset time gets closer, it got super crowded, and really hard to have a conversation. Beautiful views! Worth a visit!